"Puzzle Rotate" is an addictive mind-challenging game. falling one per block, the block will be a whole stack rotated 90 degrees, three identical blocks connected in a direct line to eliminate. Minimum total scores must be achieved for a specified number of moves to get successfully to the next level. 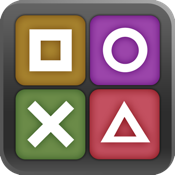 ✭ Continuous gameplay - endless fun for puzzle lovers. ✭ Two game mode of the game. ✭ Game sounds and background music. ✭ Detailed instructions and Game Tips. ✭ Game Center, 28 achievement (1000point).